Bitcoin’s price broke the USD 5000 threshold this week. Since the start of this year, the ‘cryptocurrency’, as some like to call it, has almost quintupled in value. Others like to refer to bitcoin as gold 2.0, suggesting it functions as an asset that is likely to keep its value over time. Meanwhile, the number of ways to invest in bitcoin is growing rapidly, as is the number of bitcoin exchanges. All this underpins the notion that bitcoin is increasingly treated as a separate asset class. But what are its characteristics and how does it impact traditional investment portfolios holding equities and bonds? To get an idea, I first looked at some general features of traditional asset classes, like size, risk and return. Let’s start with size. At a price of USD 5650 (source coinmarketcap.com) the ‘market cap’ of bitcoin equals roughly USD 94 billion (that’s more than double the market cap since my last bitcoin update in July). Roughly USD 100 billion is an impressive number by any standard. Only a few listed S&P 500 Index companies managed to grow this large. But that is on an individual company level. As as asset class, bitcoin remains relatively small number compared to the market cap of traditional asset classes. This is shown in the graph below, which is derived from the (well-recommended) research by Doeswijk, Lam and Swinkels (2014) on the value of the global multi-asset market portfolio. The chart shows the investable market capitalization for all major asset classes. For example, the total market value of global equities, ultimo 2016, was approximately USD 42 trillion (or 42 000 billion). With the MSCI All Countries World Index up 17% in USD this year, the current market cap should be roughly USD 49 trillion (leaving the effect of IPOs and delistings aside.) This means that the market cap of equities is more than 500(!) times bigger than that of bitcoin. In addition, the market cap of the ‘smallest’ of the major asset classes enclosed in the global multi-asset portfolio, high yield bonds, remains significantly larger than that of bitcoin. The market cap of high yield bonds, which are up almost 10% this year, is probably close to USD 2000 billion currently, based on the total market cap of USD 1845 billion at the end of 2016. This makes the asset class high yield bonds 21 times bigger than bitcoin. To summarize, if bitcoin were to be added to the global multi-asset portfolio, it would have a weight of just 0.09%. More risk equals higher return. Long-term, this tends to hold for traditional asset classes. But what about bitcoin? The chart below shows the average annualized return of bitcoin and of traditional asset classes since July 2010 (when bitcoin started trading on exchanges). Over this period, bitcoin’s annualized return is an incredible 370%. Such a mind-boggling average return suggests that bitcoin is pretty different from traditional asset classes. We should, however, take into account that bitcoin’s history is very brief, long-term data are not available. 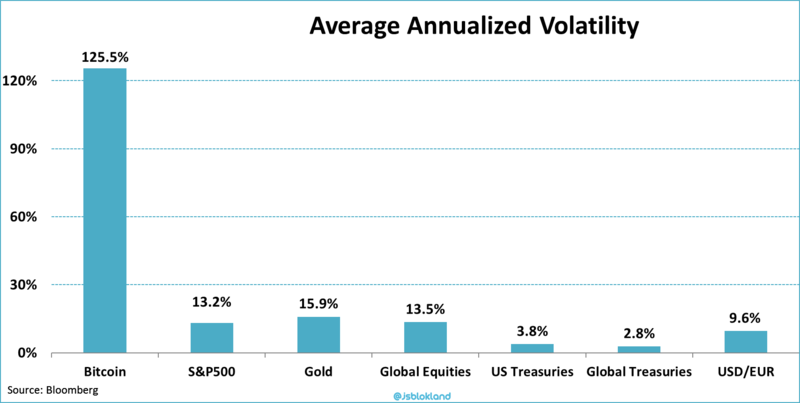 In addition, traditional asset classes can record pretty incredible short-term returns as well. For example, between October 1998 and March 2000 the NASDAQ Composite realized an average annualized return of 144%. Still, 370% is pretty extraordinary by any standard. So what about risk? Well, just look at the chart below. Bitcoin’s risk profile is pretty extraordinary as well. Again starting in July 2010, bitcoin has an average realized annual volatility of 125%. Again, for comparison, during the height of the IT bubble the NASDAQ’s annual volatility equaled 26%, one-fifth of the volatility of bitcoin. It’s often mentioned that bitcoin’s volatility profile has become more stable as the bitcoin market space developed. But, while the chart below certainly confirms bitcoin’s volatility is currently lower than before, the level of risk remains much higher than that of any other class. 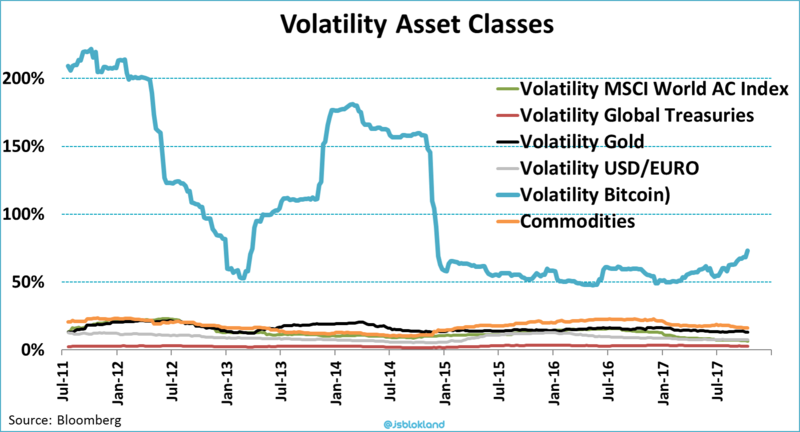 During the last 52 weeks, the annualized volatility of commodities (16%), the second riskiest asset class, was little over one quarter of that of bitcoin (73%). Equities had a realized volatility of just 7% during the last 52 weeks, less than one-tenth of the volatility of bitcoin. The Sharpe-ratio (return divided by risk) is often used as a measure to determine the attractiveness of an asset class. It reflects the amount of return per unit of volatility. As can be derived from the chart below, bitcoin scores extremely well on the Sharpe ratio. Since July 2010, bitcoin’s annualized Sharpe ratio is 2.95, 2.5 times the Sharpe ratio of the number two, global treasuries. 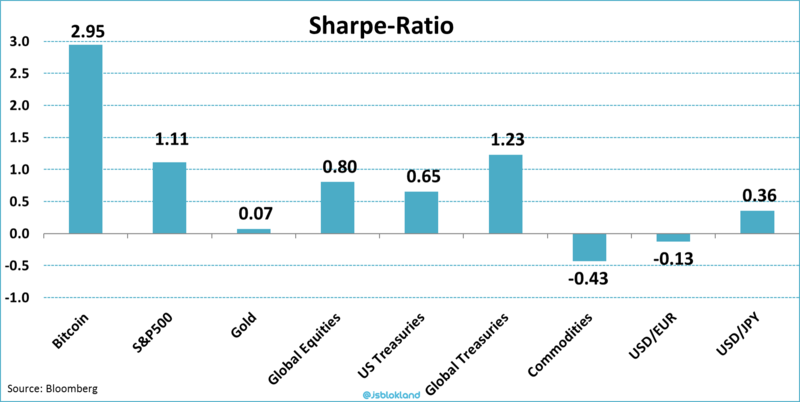 In general, a Sharpe ratio north of 1 is considered very attractive. Bitcoin’s impressive price volatility has, so far, been compensated by an even more impressive return, pushing the Sharpe-ratio up. If you ‘forget’ to look at the underlying data, bitcoin should be considered as an extremely attractive asset class. Within a multi-asset portfolio correlation is key. Two asset classes that behave exactly the same way don’t offer any diversification benefits, while two assets that behave in the exact opposite way often result in little risk but also in little return. The table below shows the correlation between weekly returns on bitcoin and traditional asset classes. As may have been expected, since bitcoin comes with such extreme return and risk characteristics, the correlation is very close to zero. There is no significant relationship between the returns of bitcoin and those of other asset classes. Worth noticing is that, while bitcoin is regularly referred to as a kind of digital safe haven or digital gold, the correlation between bitcoin and gold is also very close to zero. This suggests that gold and bitcoin are two very different creatures. Nor correlation, nor Sharpe can tell the whole story of how bitcoin behaves in a traditional multi-asset portfolio. The available price and return data do, at least from a historical perspective. Suppose you invest in a traditional multi-asset portfolio of 50% equities and 50% government bonds and decide to add 1% of bitcoin in July 2010. This may sound as a very minimal allocation, but the chart below reveals the opposite is true. 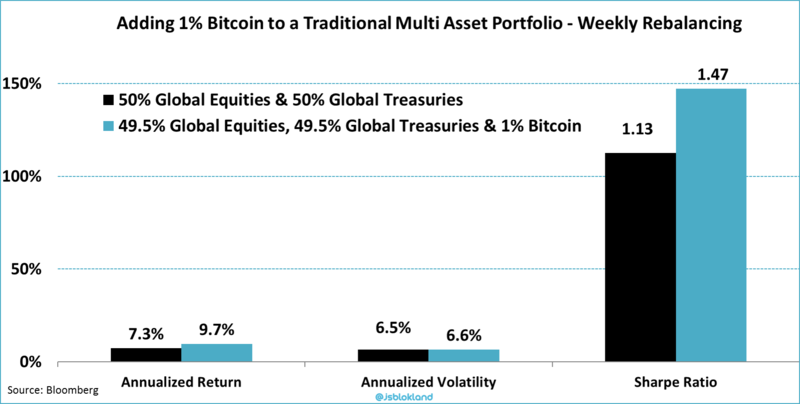 If you created a multi-asset portfolio in July 2010 consisting of 49.5% equities, 49.5% bonds and 1% bitcoin you would have realized an average annualized return of 149% with an average annualized volatility of 85%. For comparison, I also added the return and risk of the traditional 50% equities and 50% bonds portfolio. As you can tell from the graph these two portfolios are in no way comparable to each other. That is, only if you did not rebalance your portfolio. This is a very important notion as the weight of bitcoin in the portfolio would have grown to more than 99% by now. For a traditional buy-and-hold portfolio bitcoin just doesn’t fit. Surely, most investors would have opted to rebalance their portfolio, especially since they explicitly picked a starting weight of bitcoin of just 1%. Therefore, let’s take another look at the multi-asset portfolio that invests 1% in bitcoin, but this time rebalances every week. If the weight of bitcoin is brought back to its original 1% every week, things look totally different. Rebalancing at this frequency means bitcoin’s weight would never have surpassed 2%, hence its extreme risk-return profile did not get the chance to dominate the entire portfolio. In fact, weekly rebalancing resulted in an investment portfolio with the pretty much the same volatility as a traditional 50% equities and 50% bond portfolio, but with higher realized return (9.7% v 7.3%), as is shown in the graph below. Hence, adding a stringent rebalancing frequency prevented bitcoin from dominating the portfolio without giving up on the return potential due to the low correlation of bitcoin with other asset classes. Obviously, there is one caveat related to this strategy. The chart above does not take into account trading costs. Trading costs differ greatly between markets and investor types. But especially for retail investors weekly rebalancing is likely to significantly impact returns as they often pay a fixed amount for each transaction and make less use of derivatives. In addition, trading bitcoin also comes at a cost and is far less straightforward than trading equities or bonds. First, as an asset class bitcoin is still a relatively small one. Also one that is unlikely to be available for every investor. When all investors, that together hold the global multi-asset portfolio as mentioned above (total value USD 106 trillion at the end of 2016), want to invest 1% of their portfolio in bitcoin, its market value would have to grow another 11-fold (to USD 1.06 trillion) instantly to make that possible. 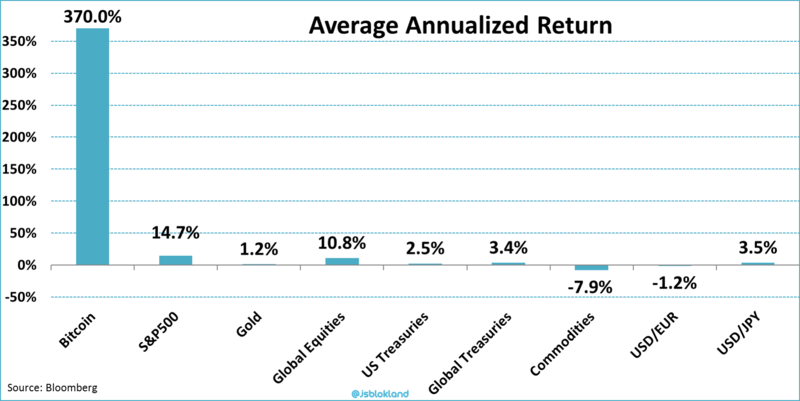 And this is without taking account the strong returns of most asset classes this year. Second, bitcoin as an asset class comes with an extreme risk-return profile. So, while its Sharpe ratio is way better than that of any other asset class, and the correlation with these other asset classes is basically zero, the sheer magnitude of both volatility and return should be taken into account. Which brings me to my final point, adding bitcoin to a traditional multi-asset portfolio requires a rigorous, and potentially costly, rebalancing scheme. 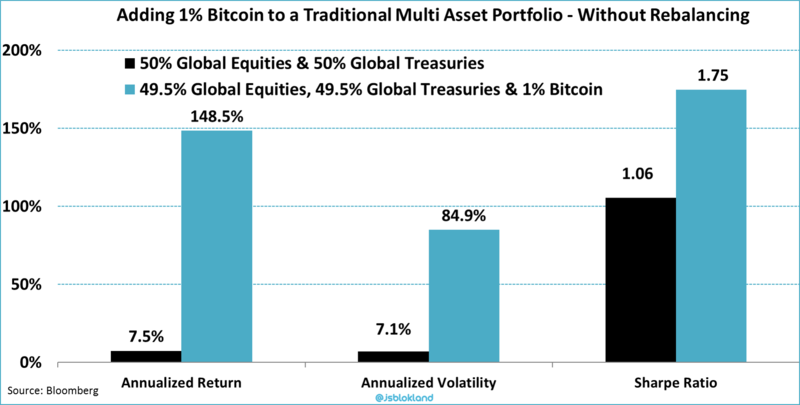 In the example of adding 1% bitcoin to a traditional multi-asset portfolio, a weekly rebalance frequency was required to prevent bitcoin from dominating the total portfolio. Still, this last example does show that for those who were able to rebalance at minimal cost, bitcoin could have added value. Source: Doeswijk, R., Lam, T., and Swinkels, L., 2014, “The Global Multi-Asset Market Portfolio, 1959–2012”, Financial Analysts Journal 70(2), pp. 26-41.